Radishes, which belong to the mustard family and have a scientific name of Raphanus Sativus, taste similar to the pepper, but is characterized with that crispy texture that makes you think that you’re munching on chips instead of a vegetable. They can be served raw, cooked, or pickled. Black radishes, which can be found in Europe, have a stronger tang than the most common varieties of radishes, which are small and cherry-sized and are colored red on the outside and white on the inside. Large white mooli or diakon radishes, which are carrot-like in shape and which taste mild, are a popular ingredient to Asian dishes, particularly in Japan. Green radishes, which are endemic in the North China region, taste sweet and are less pungent in nature. Watermelon radishes also taste sweet and are less peppery than other kinds of radishes. 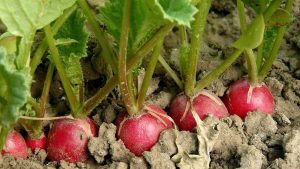 Radishes’ pungent flavor can be traced to the isothiocyanate compound in them, which range from just mild for white icicycles to extremely hot in the red globe and other pigmented varieties. The parts of the radish that are usually eaten are the flowers, pods, and seeds. In some areas, the top greens of the radish are also ingested, as a salad or as part of the main meal. “Eating pungent radish and drinking hot tea, let the starved doctors beg on their knees”. This is a famous Chinese saying that attests to the beneficial effects of radish to the body. The Chinese of the ancient times were of the belief that eating radishes and other vegetables under the brassica group, such as cabbage, cauliflower, and napa cabbage, can bring about a holistic positive effect to one’s body. Radishes are low in calories. A fresh root adds a mere 16 calories per 100 grams to your daily caloric intake. This means that even if you take your fill of the vegetable, there is no danger of you getting fat. Also, eating radishes can make you feel fuller longer. This is good for people on a diet, as radishes are low in digestible carbohydrates, high in roughage, and are rich in water. Radishes can be an ally towards prostate, breast, colon, and ovarian cancer, as it is rich in the isothiocyanate antioxidant compound called sulforaphane, which prevents the growth of said cancer cells. Radishes are vitamin C-rich. vitamin C is a water-soluble antioxidant which is needed by the body to better facilitate the process of collagen synthesis, which in turn makes it possible for the body to get rid of harmful free radicals and increase the body’s immunity levels. A common treatment for jaundice is the ingestion of radishes, as they get rid of bilrubin — a yellow substance that emerges when the liver breaks down old red blood cells — by providing a fresh batch of oxygen into the blood. Eating black radishes is best when you are treating jaundice; focus on eating the leaf part of the radish for optimum results. Aside from treating jaundice, radishes are also used to treat leucoderma, a skin condition which causes white patches to appear on the affected part. Radishes’ seeds should be soaked in vinegar, ginger juice, or cow’s urine and then placed on the affected part. Eating radishes can also aid in the treatment. The ingestion of radishes is good for kidney cleanup and prevents infections of the urinary system. Radishes, since they are very high in fiber, are good in maintaining the normal processes of the excretory system. They prevent the occurrence of diarrhea by firming up loose stool. If you are having problems with your throat, nose, windpipe, or lungs, eating radishes might ease your condition. Eating radishes is good for your respiratory system — it can decrease the congestion that you feel in that area. Radishes are usually eaten raw, salad-style, but are sometimes added to soup to add flavor to it. Here are other ways in which you can enjoy a serving of radish. Radishes are low in calories, so you can eat as much of them as you want. Radishes straight-up kill cancer cells, which prevents the development of prostate, breast, colon, or ovarian cancer. Radishes can be used to treat jaundice and leucoderma. Eating radishes is good for your urinary, excretory, and respiratory systems. In India, radish is used as a diuretic and a facial cosmetic.